ePub files can be read on smartphones, tablets, computers with downloadable e-reader app. Also on Adobe Digital Editions, Google Play Books, iBooks. 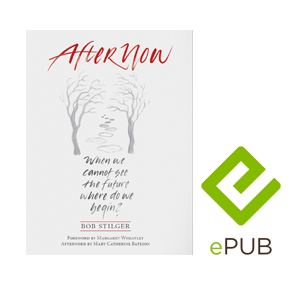 Bob Stilger is the Founder and Co-President of New Stories, a nonprofit that uses the power of story to help people create thriving resilient communities. After leading a local community development corporation for 25 years, Bob’s work has stretched to many parts of the world including Japan, Zimbabwe, South Africa, Brazil, Australia. Co-President of The Berkana Institute from 2005-2009, Bob teaches at St Mary’s College of California and Gonzaga University. He has a PhD in Learning and Change in Human Systems from the California Institute of Integral Studies. Since 2010 he has done extensive work in Japan, introducing collaborative spaces called “Future Sessions” as well as many participatory leadership processes. Eiji Press of Tokyo published "When We Cannot See the Future, Where Do We Begin" in June, 2015. English Edition will arrive in 2016!